Service, imaging, open source, archive, image sharing, clinical trials. 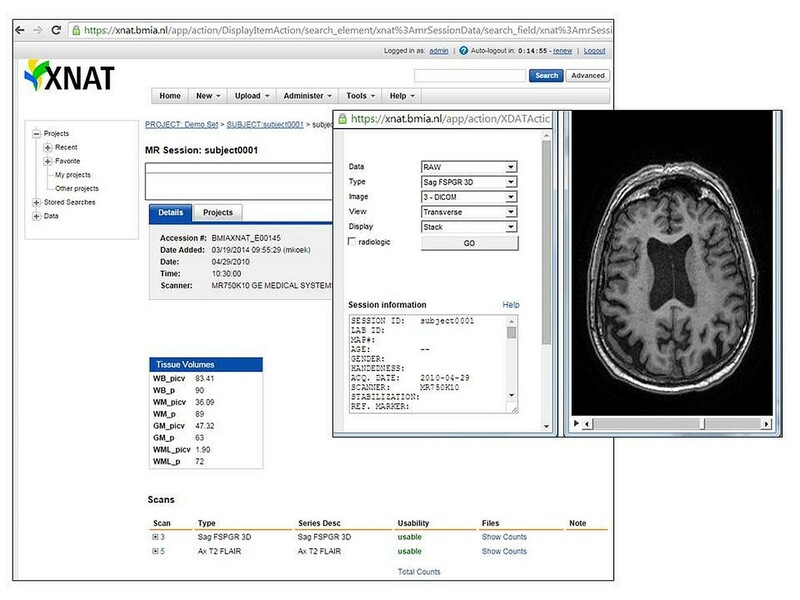 The XNAT imaging platform is a web service for storing, organizing, and sharing medical imaging data. It is based on the open source eXtensible Neuroimaging Archive Toolkit (XNAT, http://www.xnat.org) . The platform is suitable for both single-center and multi-center clinical studies with imaging data (Figure 1). Medical imaging data (in DICOM format) and image-derived data (often in non-DICOM format) are supported. Downloading and uploading is possible via the web interface, via the DICOM protocol, and via a RESTful application programming interface. Read and write access rights can be controlled per project and per user. In the context of the European BioMedBridges project and the Dutch CTMM TraIT project, two XNAT instances have been put in production. In the CTMM TraIT instance, which is especially supports multi-center clinical imaging studies, submission of DICOM imaging data is performed via the RSNA Clinical Trial Processor (CTP) to enforce proper anonymisation. In order to simplify and automate the installation of XNAT, we developed scripts based on the “Puppet” configuration software. These scripts have been made publicly available via the XNAT marketplace (http://marketplace.xnat.org). XNAT user interface. Example project with magnetic resonance imaging (MRI) data of the brain. A recent stable release of the XNAT software is used. Currently (since November 2014), we are running version 1.6.2.1. The XNAT instances are in use by several research projects. The configuration scripts are in active development, and the current release is version 0.2 alpha. Researchers using medical imaging data. Documentation and links to both XNAT instances and Puppet installation scripts [http://xnat.bigr.nl]; documentation of RSNA CTP [http://mircwiki.rsna.org/index.php?title=CTP_Articles]. The BioMedBridges project is funded by the European Commission within Research Infrastructures of the FP7 Capacities Specific Programme, grant agreement number 284209. The TraIT project is an initiative from the Center for Translational Molecular Medicine (CTMM).